I have become obsessed. Planning, sorting, shopping, dreaming. All about fabric, sewing and creating my own wardrobe. Lofty goal is to not purchase any ready-made clothes. Attainable goal, make as much of my wardrobe as possible. If something is wearing out, don’t buy a replacement, make it. There are amazing resources, free patterns, blogs about altering patterns to suit my own body or style, etc. available. And I plan on getting some Spring sewing done. The top four are from Organic Cotton Plus. Double Gauze, interlock (stripes and geometric design), and twill. The bottom is a double knit from Joann. 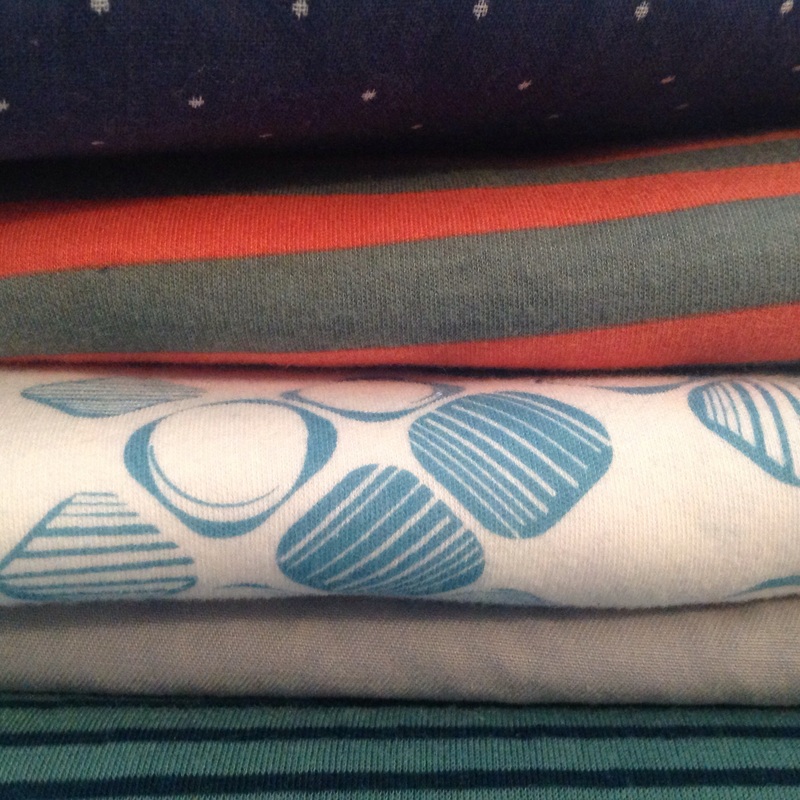 Amazingly, there are still two fabrics on the way from Organic Cotton Plus! A cotton voile, for a tunic from one of my Japanese books, Stylish Dress Book: Wear with Freedom (link is to book in English, mine is not, but I can always email Brennan! ), and a Cotton/Hemp jersey for another t-shirt (probably another Wiksten hodgepodge). For a glimpse at some of my inspiration down this track, I need to point you to another blog. If you are into handmade, minimalism, or sustainability, you will find it interesting. I haven’t followed all the steps yet, but plan on following along quite a bit. I am so excited for this…but I know I get a bit obsessed and one-track-minded. So, I hope I remember to feed my family and do the laundry, and….